Home » Interviews » Interview with Marcel Sobieski of TeslaThemes, a promising Theme Club. 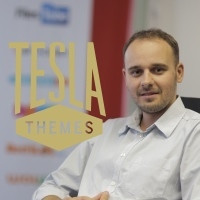 Interview with Marcel Sobieski of TeslaThemes, a promising Theme Club. TeslaThemes is a quite new WordPress Theme Club, launched just about 3 months ago. Therefore you won´t see any of their themes ranking on our Top WordPress Themes reports yet (they haven´t been in the market long enough to get there). Nevertheless I thought it would be a good idea to contact them, since their themes seem to have a quality level good enough to make this provider a serious candidate for our Top WordPress Themes reports in the future. I realized that Jeffro from WPTavern had already posted an interview with TeslaThemes, but I wanted to give it a more personal twist and get to know the people behind this project (and see their faces, too). TeslaThemes´ CEO Marcel Sobieski was very kind to accept our invitation to be interviewed, and Igor Pisov, their Online Marketing Manager, got quickly back in touch with us to send us some pictures and answers. Not only that, they even provided us with a special coupon code for our readers, offering you a 20% discount if you want to join their theme club! (check it out at the bottom of this post). 1 – What is TeslaThemes? TeslaThemes.com is an exclusive shop of Premium WordPress Themes coupled with clean design and advanced features. It offers Multipurpose WordPress Themes for all bloggers, freelancers, web agencies or business owners, willing to set up and run professional websites with beautiful layouts. All our WordPress Themes come with extensive documentation, dedicated premium support, a powerful Tesla Framework, responsive design, unique features, free updates, affordable price and much more. 2 – Who is TeslaThemes? 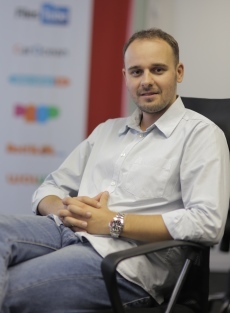 TeslaThemes is a part of Red Sky (Poland), the company that created Filestube.com, one of the most popular files search engines in the world, with more than 130 million visitors per month. 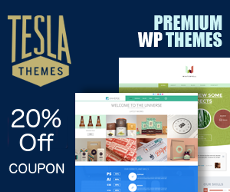 We all (the folks behind TeslaThemes) are guided by the personal passion to WordPress and wish to make our website one of the leading shops of Premium WordPress Themes. 3 – When did you start the TeslaThemes project and what were your first steps? We are designing and developing premium WordPress themes since March 2012, but the idea of opening our own online store where we fully interact with our customers, to deliver them a 24/7 support, any customization support, etc., popped up a year after, to be more exact in March this year. So we launched http://teslathemes.com/ on May 25th. The same day we’ve got in touch with almost all our customers and getting new ones. Our goal is to have 2 new WordPress Themes/month for the next 2 years (since our launch we have already released 6 new themes). We will also expand our portfolio with eCommerce templates, News/magazine themes, creative themes and much more. Additionally, our team is involved in another big project that is related to premium themes and templates called http://winithemes.com/ – one of the most comprehensive online collections of premium Templates for WordPress, HTML, Joomla, Drupal, Magento and more. 4 – Releasing two themes per month seems quite a challenge, particularly when it comes to support. How do you plan to handle it? We are already doing a good job, since our launch we have released 6 brand new WordPress Themes and 2 more are in development. Regarding the support, we have facilitated this process a lot by introducing Tesla Framework, all our features are unified and standardized, so every developer knows exactly where and how to fix a problem or help a customer. We track the number of issues on our Forums and keep it always solved at 100% rate, as fast as possible. Additionally, we have switched to an internal support ticket system to make the process of support more efficient. 5 – Why did you choose the name Tesla? Anything to do with your mission or business model? The idea came to us spontaneous, it just appeared suddenly and we all agreed that this is great choice. We tend to not associate it with anyone/anything, however we all know who Nikola Tesla was and what great inventions he left. We try to bring something new to the WordPress Themes market and we consider ourselves some kind of innovators, so in this perception maybe there is a kind of similarity. 6 – What do you think will help TeslaThemes conquer its own place in this saturated WordPress theme market? We are guided by our personal passion to WordPress (and this great community) and try to contribute with something new, innovative, unusual. When creating our themes we try to think outside the box, and our customers are guiding us and giving us the confidence we need. Second important thing is that we give to our affiliates 50% from each sale, all time, no restrictions. This is a unique payout for affiliation, we’ve never met any other company giving such a big rev-share. We have no minimum amount for withdrawal! That is why our affiliation program becomes very strong. We help both sides: those who are establishing their online identity with a premium website and the other crew who earn money daily with affiliation. And finally, we are constantly releasing new themes for different categories or industries, our subscribers have a really great value for the price (you can get all our WordPress Themes for only $35, this is one of the lowest prices on the market + you get access to all our newly launched themes). At his moment the profit is not our main goal, however the things will change in the near future (we plan to increase a bit our prices), as we offer more complex and rich products and services and invest more in our support and quality systems. 7 – Speaking of uniqueness, I´ve noticed you are trying to release themes that can offer something different from other theme clubs, your Cool Stuff theme being a good example for this. What is your strategy for future theme releases to maintain that sense of singularity? Yes, this is an important part of our designs, we wish to associate our layouts with a unique/personal style and want to stand out from the crowd (in this saturated market). Additionally, we are working on a lot of niche themes like Magazine, eCommerce, Portfolio, Wedding, Medical, etc., to provide our Subscription members a complete set of themes for any demands or any category. 8 – There are thousands of WordPress themes out there. 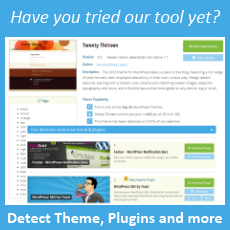 What does a theme need to be considered as a good WordPress theme, in your opinion? A good WordPress Theme should have a great design, a lot of customizability options, a powerful technical frame, extended documentation and comprehensive support, should be easy to use and update. All these should help the user to easily set up and personalize his template, without advanced knowledge of web development. Each customer wants something very specific for his website and it’s important to give him the template that will turn his website into anything he wants. He should be able to see his ideas (the look of his website) in your Live Demo. 9 – You said all your themes come with the Tesla Framework. What is it exactly? Tesla Framework is a powerful frame and administration tool that allows you to easily customize the look and functionality of your theme, without web development skills. It is available in a dedicated area from your WordPress admin where you can personalize your theme as you wish. You can change your site logo, background, colors, fonts, include your custom CSS, manage your subscribers, manage your social media options, set up your contact info, import our Live Demo, update your theme and much more. We’ve recently launched on our site a dedicated page with our Framework Tour, where users can discover all these great features. 10 – You´ve decided to go with the club route (and at very affordable prices) instead of just charging a larger amount per theme. Is this a long term strategy? The reason we yet have so affordable prices for single themes and annual subscription, is lack of financial priority at the moment. All the prices will go up for sure in the next months. Our design and development department are working now on 2 new niche templates that must come up by the end of August, 2013. We offer 3 packages: Single Theme for $25, Standard Subscription which includes all existing themes + all new coming in the next 12 months (we estimate to have 20+ premium templates by the end of the year) for $35/year, and the Developer Subscription which includes all the .psd files which is a great help for those who want to fully customize even the design and layouts for $55 a year. And there are no hidden fees! Such a low price might seem a little alarming, but we have proved (and our customers can assure that) that a premium Theme/subscription can be sold at a very reasonable price. So, have a look at our Premium WordPress Themes and join our great community. 11 – How has it gone during your first 3 months? Are you happy with the results so far? Yes, we are happy with the results so far: our client base is growing very fast, we’ve released 6 new Premium WordPress Themes and are working on 2 more new themes. We managed to attract a lot of new Affiliates and Partners and became quite known in the community. We are doing our best to turn our website into a reputable WordPress Themes shop. 12 – Anything you would like to add about what we can expect from TeslaThemes in the next future? We have a lot of great things to reveal in the near future: we are working on several new WordPress Themes with awesome design, we plan to launch some great special offers and contests, we’re also improving our Tesla Framework and working on some website optimizations. Additionally, we plan to adjust a bit our pricing, so hurry up, this might be your last chance to get our themes at this great rates. 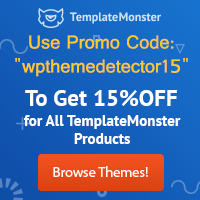 Get 20% off TeslaThemes by using the coupon code WPTDETECTOR.